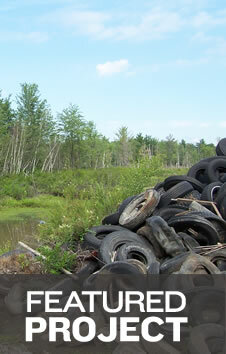 According to the U.S. Environmental Protection Agency, more than 250 million scrap tires are generated annually in the United States. 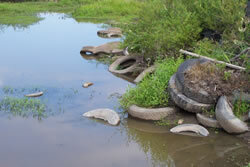 The waste areas used to stockpile these scrap tires pose a significant threat to public health and safety, as a potential source of pollution, disease, and, perhaps most egregiously, fire. Fires at tire stockpile sites have polluted the air over hundreds of square mile areas, burned for months or years, and typically cost millions of dollars to extinguish. Consequently, scrap tire management has been identified as a social priority that is currently being addressed through State laws and other forms of public regulation. 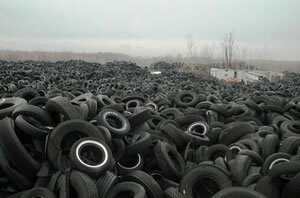 In 2004, the New York State Department of Environmental Conservation (NYSDEC) determined that Fortino was the most significant stockpile of scrap tires in New York and, as such, most in need of immediate remediation in conformance with expressed goals of the New York State Waste Tire Management and Recycling Act of 2003. NYSDEC expedited this initiative by obtaining professional services through an existing, multi-year, term contract between the New York State Office of General Services (NYSOGS) and Shumaker Consulting Engineering & Land Surveying, D.P.C. (SCE). As the prime and sole consultant for the Fortino Tire Stockpile Abatement Project, SCE was responsible for the design of infrastructure, environmental permitting, and construction assistance tasks required to support a waste tire remediation project at an existing tire pile site in the Town of West Monroe, NY. Major elements of the infrastructure design included: access roadways, scale facilities, shredding facilities, wastewater management, stormwater management, shred storage, shred washing, and shred load-out facilities. These facilities were designed to remove and shred tires into an acceptable civil engineering product (embankment fill), while also addressing the mitigation and remediation of environmental and life safety issues on site. The fundamental complexity of this unusual assignment was intensified by existing conditions at the Fortino site, such as the extensive, classified wetlands that enveloped the waste pile and limited access to the project area caused by localized flooding produced by beaver native to the project area. Further constraints on the project design were imposed by a disarming array of public health and life safety issues, not least the imminent security threat presented by arson and an ecologically catastrophic pile fire; the activity of disease vectors, such as mosquitoes or other types of vermin; or the environmental degradation that would occur if PCB’s, or other contaminants present at the site, migrated into local surface water bodies or the subsurface aquifer.